The lowest priced 4-inch smartphone is in town, and it's from Cherry Mobile! 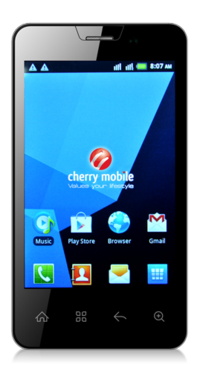 We have been getting some deets about the Cherry Mobile Sonic since last month but its complete specs had just broke out of the box. To highlight a few, it'll have a 4-inch HVGA (480x320p) capacitive display which encompasses a 144ppi pixel density, a gigahertz single-core processor, 256 MB RAM and a dual-SIM capability. It's interesting to note though that the both Sim slots were different in size - one goes with a mini SIM and one with a micro SIM. Before you consider this phone, you ought to know some of the deal-breakers. Aside from the fact that it only runs with a slightly outdated Android 2.3.5 Gingerbread, it lacks 3G connectivity. So you'll just have to settle to, atmost, 2G for you cellular connectivity and WiFi for internet browsing. It's still a good buy, though, at Php 2,999. For those interested, it's now available nationwide.